jOBS opens with the introduction of the iPod on October 23, 2001 at an Apple Town Hall meeting. In the audience are a somewhat slimmer Jony Ive and other Apple employees. In the scene, Ashton Kutcher, as an aged and bearded Jobs, delivers the product and a company stump speech over a rolling crescendo of a score that wouldn’t feel out of place at the climax of a sword and sandals epic. It’s one of a couple of cringe-worthy moments that places events from Jobs’ life on a pedestal, hammering the audience over the head with their significance. 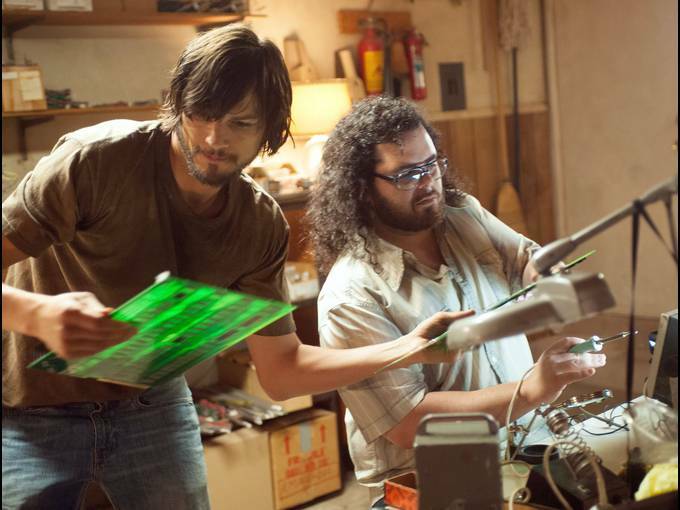 Thankfully, there are only a couple of these moments in what is otherwise a workmanlike and entertaining movie about the ‘first era’ of Steve Jobs. And much of the good stuff about jOBS, of which there is plenty, stems from the great work put in by the leads. Josh Gad, though he may have been working from an impressionist’s idea of what Steve Wozniak was all about, translates with heart and warmth. Woz is not portrayed as a bumbling, clueless geek, but rather a very smart and mischievous man who knew exactly what he wanted from his partnership with Jobs, and exactly when he needed to end that partnership. There are also good supporting turns by Dermot Mulroney as gravitas-imbued early investor Mike Markkula and J.K. Simmons as combative Apple money man Arthur Rock. Unfortunately, others like Lukas Haas’ Daniel Kottke and Matthew Modine’s John Sculley are under-utilized. 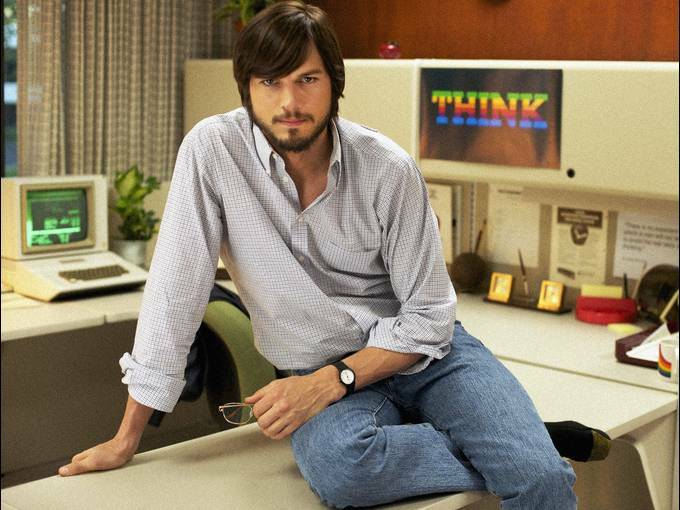 Of course, the elephant in the room needs addressing: how is Kutcher as Jobs? Quite capable, actually. Kutcher’s Jobs has the hunched, rolling gait of the man, and the kinetic nature of his hands. His flat, piercing stare and clipped delivery works almost perfectly throughout. Even if you’ve spent an enormous amount of time listening to or watching Jobs, you’ll be impressed with his overall performance. There were a few moments where he dropped out of cadence in his speech and such, but the impression that I got on the whole is that he got it right. I know that his performance as Jobs will get a lot of attention, especially as there are many alive who still have their memories of him fresh in mind. But it’s a fantastic, if not wholly factually accurate, performance by Kutcher. There will be those who will attack the accuracy of the film, and there are plenty of chances to do so. Significant swaths of technical development of the Macintosh and Lisa computers are simply not present, like the visit to Xerox Parc and subsequent licensing of the technology that Jobs saw there. Subsequently, the roles of some people, like Jeff Raskin, in the development of the Mac are significantly altered and bent away from reality. Key members of the Mac team like Andy Hertzfeld and Burell Smith are essentially cameos. But the license was necessary. Life doesn’t always fit into neat narrative arcs and (though I’m prepared to get pilloried for this) I’m perfectly fine with seeing some of these details through the lens of ‘service to art’. Just as a story will change depending on the teller, this is one version of Jobs’ life and I don’t begrudge the filmmakers their decisions. As far as the look and feel, the set dressers, wardrobe and props people did a fantastic job making the period segments look great, including the touted bits shot in Jobs’ original garage. Cinematographer Russell Carpenter, for the most part, also makes this look like a much more expensive movie. Though there is a significant amount of flat corporate lighting in the movie, and there isn’t a ton of bold choices made cinematically, it still feels like quality. He even manages to work in a shifting palette that takes you from the warm tones of Jobs’ LSD and exploration-rich youth through the crisp neon-lit early Apple days and into the clean, sparse second era. Director Joshua Michael Stern manages to stay out of his actor’s ways for the most part, though a lot of that could come down to the fact that Jobs was confrontational to a fault, but was never really shown to enter into any really meaningful conversations. Helming a movie about such a shrouded and mercurial subject can’t be easy, as every ounce that you expose or give away is one less ounce of mystery. Unfortunately, second act pacing issues plague the film, which feels longer than it needs to be. Too many introspective segments in which Jobs does a lot of looking into the camera and standing in wide shots that are meant to emphasize his loneliness and distance from those around him. There are too many scenes meant to convey Jobs’ ‘force of personality’ that basically consist of him yelling at, rather than interacting with characters. And there’s also an abortive attempt to ascribe Jobs’ drive to the fact that he was abandoned as a child, which goes nowhere. But, overall, jOBS works. The lead actors are likable and appear to have put serious effort into getting the spirit of the characters right. The film looks (mostly) good aside from some of what could likely be ascribed to budgetary constraints. And though the director is a tad indulgent here and there, it doesn’t take away from the overall feeling of ‘decent’ that I came away with. This isn’t going to be the canonical Steve Jobs biography movie. Honestly, Jobs was such a complex individual that I can’t see one ever being made. But, as an impressionist portrait of a specific period in his life, it’s successful. Don’t go into it looking for complete verisimilitude or whip-crack dialog and you should like it just fine.